Owned by a tech billionaire, tiny LĀNA’I moves into the big time with a renovated resort and one fabulous golf course. WITH VISIONS OF SWAYING PALMS, orchid leis and pineapple fields hula-dancing in my head, I touch down in Lāna‘i to none of it. Cook pines, not palms, encircle the airport terminal, their columnar forms spiked by branches turned skyward. These coniferous sentinels, rather than a traditional flower necklace, welcome me to what Hawaiians still call “Pineapple Island,” even though the fruit—once abundantly harvested here on the Dole pineapple plantations— hasn’t grown on Lāna‘i since 1992. I learn some of this history from the Four Seasons Resort Lāna‘i shuttle driver as she drives the road lined by rows of evenly planted Cook pines, each of which magically extracts as much 200 gallons of water per day from the atmosphere on the driest of Hawai‘i’s inhabited islands. This “fog drip” more than triples the annual 34 inches of rain that falls there, contributing to the island’s lush vegetation—like the swaying palms I finally see upon my arrival at the Four Seasons, whereupon I also get my lei. You can’t talk about Lāna‘i, its Four Seasons or its Manele Golf Course without mentioning Larry Ellison. In 2012, the audacious co-founder of Oracle Corporation—and, at the time, third-richest person in the United States (he’s now No. 5)—purchased 98 percent of the island (the state of Hawai‘i owns the other two percent) for $300 million. Three years later Ellison sank another $450 million into transforming the Four Seasons Resort into his version of paradise. Away went the dated chinoiserie and in came luxurious interior design with a authentic Hawaiian flair: mahogany floors, koa accents, hand-woven area rugs and walls lined with artisan-produced lokta paper edged in teak and zebrawood. The entrance to the lobby—which Ellison had reportedly redone four times until it perfectly framed the view of Hulopoe Bay—displays a gallery of locally created island murals, prints, sculptures and authentic artifacts. Squawking “alohas” from Ke‘oke, a rescued cockatiel, and Uliuli, a rescued macaw, highlight the avian pep rally that accompanies my indoor-outdoor walk to one of the resort’s 213 rooms and 45 suites—each one outfitted with intuitive lighting, privacy controls and a 75-inch, platinum-bezel LED television panel to watch atop a cosseting featherbed. In the bathroom, a shower floor of smoothed volcanic stones massages your arches, while a Japanese Toto Bidet toilet with motion sensors lifts its cover as you approach and warms the seat as you sit and ponder a panel of hydraulic personal hygiene options. The plush in-room ambience extends to the labyrinthine grounds, where pieces of art and sculpture appear amid the lush, tropical foliage. 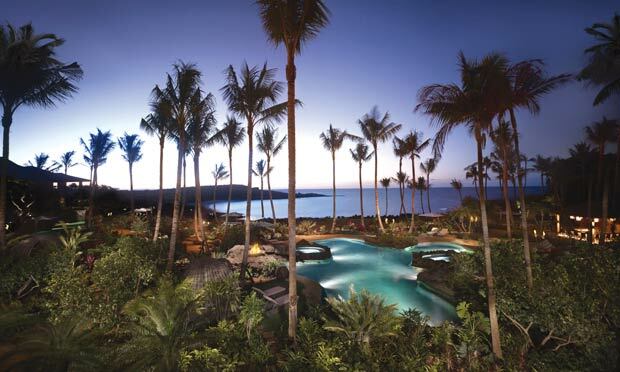 Lagoon pools and natural open-air baths tuck seamlessly into the surrounding lava rock and flora. The immaculate, swimmable beach stretches towards majestic Puu Pehe, the 80-foot-high “Sweetheart Rock.” Guests can learn about its legend—as well as enjoy various presentations that express the “true, non-cookie-cutter essence of Hawaiian culture,” according to General Manager Alistair MacAlpine—most afternoons in the Luau Gardens adjacent to the beach. 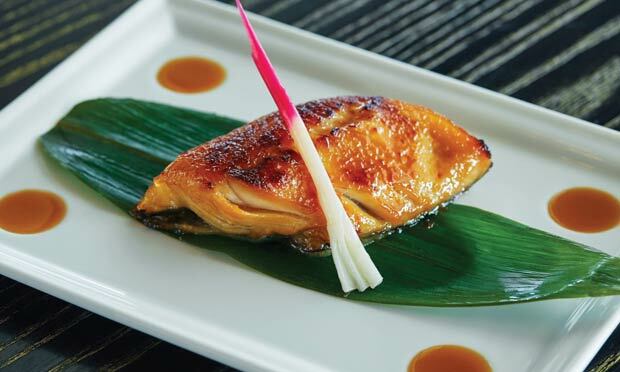 Transcendent experiences await at the Hawanawana Spa and at the internationally acclaimed Nobu Restaurant, one of the resort’s four otherworldly dining experiences (One Forty, Malibu Farm and Sports Bar are the others). You can serve and volley on a Har-Tru green-clay court or one of two outdoor Plexipave cushion courts made to the same specs as those at Indian Wells. The actual resort occupies about 300 acres but the property encompasses all 90,000 of Lāna‘i. Among dozens of activities and adventures, the Activities Ambassador can arrange shoreline and deep-sea fishing adventures, whale-watching trips, bike rentals, archery and trap-shooting experiences and an island tour to see such archaeological marvels as the Luahiwa petroglyphs and Keahiakawelo, the sacred Garden of the Gods. Also worth visiting is the Ranch at Koele, site of the former pineapple plantation. There you can ooh and aah over the miniature horses and donkeys, ride full-size equines high into the ironwood forests and, as of this spring, see pygmy goats, alpacas, Polish chickens and other uncommon livestock. Make a point, too, to check out Lāna‘i City. You’ll see that Ellison hasn’t only invested in the resort, but in the community. His management agency, Pulama Lāna‘i, has erected a cinema considered the foremost in the state, rebuilt the community pool to five-star standards, added a school and a pharmacy and doubled the Richard’s Market to the size you’d see on the mainland. If The Lodge at Koele sounds familiar, it’s because The Experience at Koele was Lāna‘i’s first 18-hole golf course (Cavendish, a free nine-holer built in 1947, still gets local play). Threading through forests, ravines and outcroppings 2,000 feet above sea level, the Greg Norman-Ted Robinson layout at Koele opened in 1990. 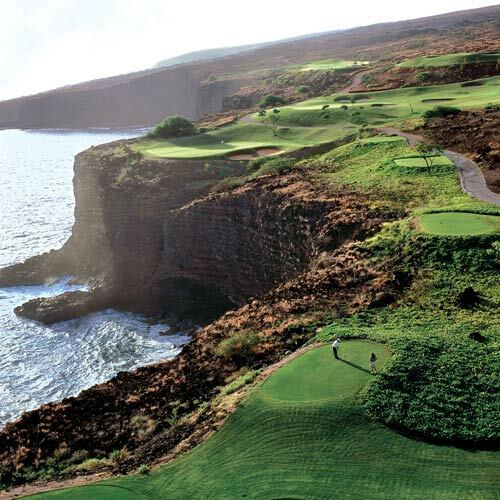 Jack Nicklaus’ oceanfront masterpiece, The Challenge at Manele, debuted three years later. Two years ago, The Experience at Koele closed, ostensibly for a renovation, but plans soon changed. 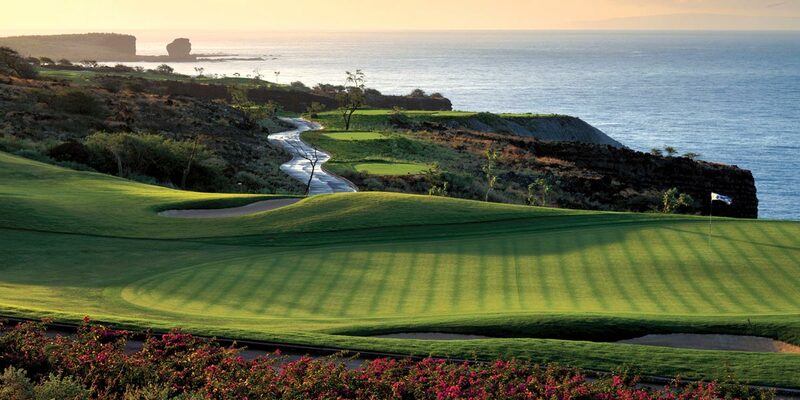 Factors included the cost of watering two courses, and lack of play compared to the waterfront Manele layout. “To be fair, it was a fantastic course, but most people coming from the mainland want to play along the ocean,” McAlpine says. With the Lodge reopening this year with more of a focus on retreats and wellness (a spa treatment hale; yoga and fitness pavilions; a new pool with 25-yard lap lanes and a water exercise area), most of the land formerly occupied by the front nine will become a sculpture garden and meditation area. The erstwhile back nine will feature a massive adventure park, complete with a rope course challenge and a zipline whistling down what was the famous par-4 17th. Talk about a carry! When it comes to carries, the Manele Golf Course has one of golf ’s most intimidating ones: the par-3 12th. It perches atop a cliff 150 above Hulopoe Bay. Any tee shot slightly off line is aloha ‘oe. The picturesque tee box served as Bill and Melinda Gates’ wedding site. With the green 200 gusty yards away— and nothing but a chasm between it and you— it takes balls (because you’ll probably need to tee up more than once) to hit from the back tee. Better to move up to the 185-yard golds or the 155-yard blues; each provides every bit the test and sense of accomplishment. As for the other 17 holes, Manele Golf Course may have dropped “The Challenge” from its name but not from its impeccable paspalum-carpeted layout. With ocean views from every hole, the Nicklaus design doglegs, climbs and dives through red lava fields, forcing risks you might not ordinarily take—if only because of the endorphins and adrenaline surges inspired by the scenery. After a downhill right-dogleg opener, the course steadily ascends until you find yourself in the fairway of the par-5 6th, the apex of which presents not only a view of the birdie-or-bust green some 60 feet downhill, but also of the two sweet consecutive par 3s and par 5 that follow. Following complimentary icy fruit lemonades and chilled towels at the turn, the great shots keep coming on the back nine—at least with your camera. The first four holes tightrope along the shoreline, their greens hanging above the surf. A birdie chance on the short par-4 13th is the perfect antidote to the hash you may have made of its predecessor. The gravity-friendly par-5 15th presents another shot at beating par, although just having a chance at a four on the par-4 17th— with its monstrous water carry off the tee and another long, accurate poke to negotiate a downhill dogleg right alongside the ocean—is a feat worth writing about (which I evidently am because I sank the par putt). Enjoying Korean short rib lettuce wraps with a Bikini Blonde Lager in the course’s aptly named Views Restaurant, I understand why Manele has steadily risen among the ranks of the best U.S. public courses. I also appreciate what Larry Ellison, a man some say has an ego bigger than his fortune, is accomplishing on Lāna‘i. And I don’t think I’ll ever stop marveling at those magical pine trees. 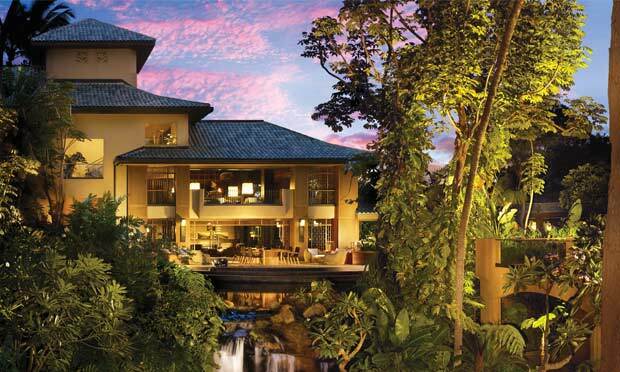 For more on Lānai, visit fourseasons.com/lanai; (808) 565-2000.